Past the halfway point in Twelve Days of Car Gifts, we have seen practical and outright frivolous items for an automotive enthusiast’s Christmas list. From an inexpensive paper foam model Dodge Charger to a Ford Shelby GT500 Golf Car, Automoblog’s sounds of the season have been an engine roar. For the seventh day, a remote controllable version of the Mercedes-Benz SLS AMG not only produces sounds but lights and motion for what could be a happy Christmas. Produced by Silverlit Toys Manufactory, the automotive gift-seeking individual at Christmas can delight in the high-functioning, mobile app enabled toy. Sold by famous unique product retailer Hammacher Schlemmer as “The iPhone Controlled Musical Mercedes SLS“, the remote controlled vehicle features some finely-crafted detail presented in a 10-inch length. Headlights, taillights and turn signals illuminate on the iPhone Controlled Musical Mercedes SLS for full effect. Most importantly, the gullwing doors open displaying the Mercedes-Benz SLS AMG’s interior. Through a Bluetooth connection, the iPhone Controlled Musical Mercedes SLS can be operated from up to 30 feet away through the free mobile app available on Apple devices. This app is only available for Apple devices running iOS 5 or greater such as the iPhone 3GS and above as well as the iPad 3. The accelerometer incorporated on a mobile device allows the user to control the small remote controlled vehicle’s motion through tilting. The app’s display replicates the experience a driver of the actual supercar with a digitized steering wheel and dash panel. In addition to steering and controlling the momentum of the iPhone Controlled Musical Mercedes SLS, music can be streamed to the small vehicle. Speakers onboard the iPhone Controlled Musical Mercedes SLS broadcasts the tunes while the gullwing doors move to the music. The multi-function remote controlled car operates on four AA batteries. 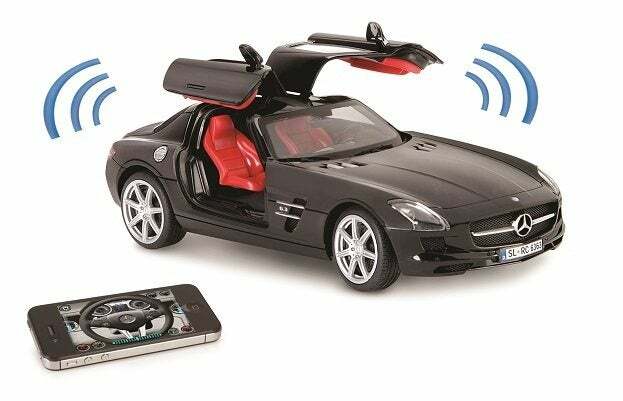 Priced at $129.95, the iPhone Controlled Musical Mercedes SLS is a sophisticated remote driven replica of the supercar. No Comments on "Seventh Day of Car Gifts: iPhone Controlled Mercedes-Benz SLS AMG"